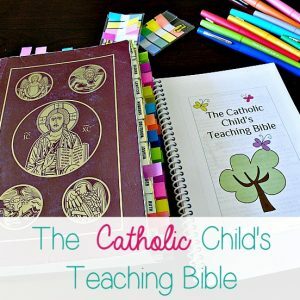 How many of your conversations begin with, “I saw this thing on Pinterest the other day…” Well, quite a few of mine do, for example…I saw this thing on Pinterest the other when I searched “Bible Journaling.” A woman had made tabs from scrapbook card stock to mark some of her favorite scriptures. Immediately, I knew I wanted to do this! I know quite a few stories, lessons or verses in the Bible, but when I need to recall them quickly, well, I can’t. I can sometimes give a general, “It’s in one of the Gospels.” Or, “It’s on a page with some green and yellow highlighting.” Umm, that doesn’t always get me where I want to go and especially not very quickly. So let’s talk about Bible Journaling: Favorites Tabs. 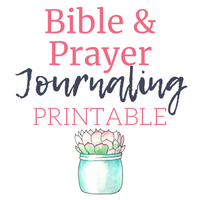 *August 17, 2016 Update: I’ve written a book, Bible Journaling Tips, Inspiration and Permission, to encourage and inspire you in your Bible journaling!
. 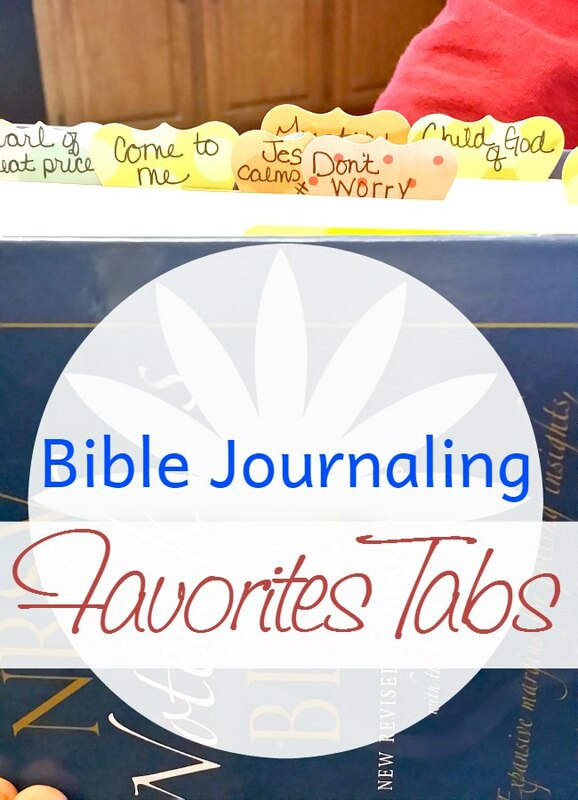 But the point of this post, because as you can see, I can very easily get off topic when it comes to talking about Bible journaling, is to tell you how I am using tabs to mark my some of my favorite verses or stories. I cannot remember where I saw this idea so I can give proper credit, other than to say on Pinterest. The idea is so simple yet simply fantastic! Other than the knowing where to find Philippians 4:8, because, um, it’s in Philippians…and other than knowing where to find the words of our Lord about worrying not adding a single cubit to our life–Matthew 6–I’m not too good at remembering where to find some of my favorites in the Bible. I hate that I cannot remember where to find the story about Jesus telling Peter He will build His Church on him–Matthew 16– or the lovely parable about the sower throwing out the seed which falls on the path, rocky ground, thorns and good soil–Matthew 13. Age and keeping up with a husband and seven children are not helping the matter. with me everywhere, so we’ll see as the year progresses if it makes the Bible burdensome or somehow compromises the structural integrity of the Bible. (How fancy did that all sound?) 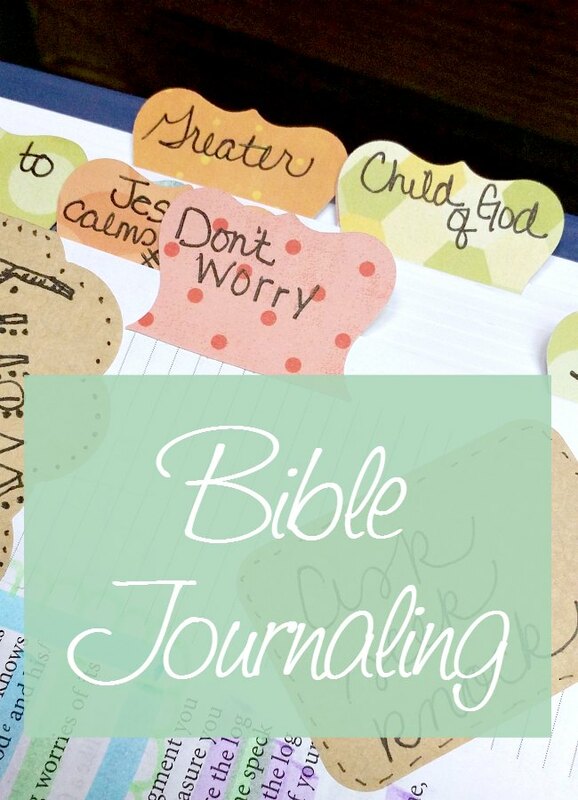 This is also a GREAT IDEA to use especially if you do not have a journaling Bible. Have you been Bible journaling? 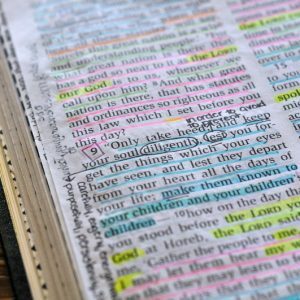 Bible journaling or not, how do you mark favorite verses or stories in the scriptures? Hi Meagan. I just peeked in your shop…lovely! I LOVE the weathered flower tabs!! I found this post on Pinterest and I just love your blog! And I really enjoyed this post – what a great idea to use cute markers for the passages we need and want to remember! Before the days of fancy stuff I used to write what I wanted to remember, Ie Don’t Worry–Matthew 6 in the back of my Bible so I would have a quick place to look. Now that bible journaling is acceptable I can’t wait to add tabs. I love the idea if your own personal index. Bible tabs or not, it’s still a great idea. Thank you. I’m glad you like the idea. I’ve always at least had a index of my favorites in my Bibles. Just so you know, the punches that you buy that make acutal tabs, yeah they stick up just as much. I like your’s so much better. Love all the inspiration. Keep of the good work. Hi Linda. Thanks for taking the time to comment. I ended up buying one of those punches and honestly don’t like it as much as my homemade tabs. Not only do they stick up, they’re thicker. Maybe not a deal breaker for some, but I personally don’t like them as much. Hello I think i know where you got the inspiration because i saw it too, but i saw it in the FB bible journaling group. http://constancedenninger.blogspot.com/2015/02/bible-tabs-for-me-references.html Fun stuff huh?!!!! Yes! That’s the picture I saw. Thank you for linking to it Stefanie. I love these tabs! I so want a journaling Bible!! I should put it on my wish list. You are very welcome Brittany. Honestly, I couldn’t get into Bible reading but I wanted to. So I prayed ans asked God to give me the desire to read my Bible. And sometimes I still have to ask that prayer. That’s ok.
I’ve never responded before , but I was reading through these & felt lead to encourage you in your time with God. I promise it will never be wasted time & if you stick with it, He WILL bless you!!! Thank you Brenda. Some of what I am learning is that the more time I spend with Him, the more blessings around me I see. Hi Kim. This has made it so much easier for me to find those favorite verses. Great idea. Thanks for sharing it with us. Thanks Charlotte. Have a great weekend. Thanks Charlotte, have a great weekend. I’m visiting from the Spiritual Sunday link-up. Hi Cathy, I’m an underliner too and this has helped me to find those special passages. I haven’t started journaling in my Bible yet, just can’t do it. But I have a journal specifically for this purpose that will allow me to do it. 🙂 I have been gathering new pens and fun things as I see more ideas,l like this one you have shared. Great idea on the tabs! Hi Dawn, I really had to get over myself with this…I wanted to but was afraid to. I just took the leap! I love that you have a journal devoted to this practice. For me, I would mess up on a page and then start a new journal…ugh! Oh my goodness. I can’t WAIT to put this into practice. I know! I’m surprised there is such a simple and beautiful solution to one of my most common problems with reading the scriptures. What a cute idea! If you did this over a year it would be a great way to look back and see how the Lord had been speaking to you throughout the year. I hadn’t thought about that Leigh. It will be nice to see in hindsight areas where the Lord and I kept meeting for some instruction, comfort or correction. I’ve been looking for new ways to interact with my bible and really journal and understand all of the little intricate differences and ways He uses the words to speak to us! Cannot wait to try this. Hi Chelsie. I’m glad you enjoy this idea. This has been a wonderful, wonderful addition to my Bible reading reading…it’s added a whole new layer and engaged a whole part of my brain that was being left untapped while spending time with God in His Word. I love your artsy idea! I am a scrapbooker, Bible study writer, and Pinterest-er. So I pinned your post! I think it would be great to buy a Bible just for this purpose. You’re right – I am not sure I could do this to a Bible I always carried with me. But it’s a great idea, and doesn’t sound too fancy. I bet you could make bookmarks that have themes. One bookmark could be on spiritual warfare, and another on worship. Thank you for your post! By the way, my mom and I came up with the idea to make scrapbook cards for our Bible study classes, and we used die cuts. Would you be willing to check out our page? The link is: http://lighthousebiblestudies.com/scrapbooked-bible-study. I’d like to get your feedback! 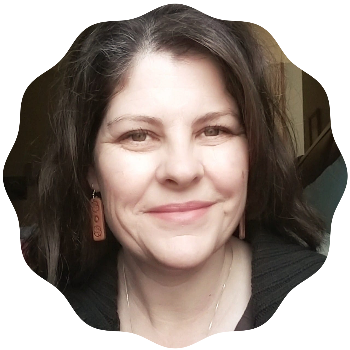 I am in the Christian Women Blogs group, if you want to contact me there. Thank you! So funny that you mentioned the bookmarks. I have been working on some! I’m headed over to look at your scrapbook cards, thanks for the link. I hope you post a bookmark if you make one! Thanks for checking out the link! Let me know what you think. I love this idea! For the first time the Lord impressed upon me to get a giant print niv bible. Not a study bible of any sorts. Just scripture and footnotes. Now I’m studying Colossians 3 this month. Just this chapter. And I’m learning to mark my Bible – which felt weird at first. But it’s my study Bible! I have drawings on the margins, marks for certain key words, highlighting in different colors. I’m learning. I think this tab process will help me more because I’m personalizing my Bible to my experience with God and my own devotion time. I did the same thing, I took one book though, Philippians. I read it over and over. I think the familiarity of the book after a while made it easier to begin taking notes in. Does that make sense? This is an amazing idea. You gotta love Pinterest! Thanks for sharing. And this is actually one thing I have pinned and accomplished! I was just thinking how many of us are “afraid” of taking notes or personalizing in a book that says “Do not be afraid” so frequently 😉 Thanks for the visit Janelle. You have inspired me to start Bible journaling! I have a question though. The Bible that you recommend isn’t available new at least not new. Do you have any other recommendations? I know I could grab a separate journal/notebook, but I like the idea of having everything together. Thank you! I know what you mean about having it all together. Unfortunately the other Journaling Bibles are lacking the Apocrypha Books. I cannot wait to see how you use your journaling Bible! I have the Thrive Journaling Bible in the New Living translation…. Love it! Jenny…I love the idea of tabs for verses or sections that speak to you. I journal but I don’t tab my Bible. My journaling is done in a notebook since my Bible is not one to journal in although I do mark verses and write small notes. I think I will add the tab idea to my notebook instead. Thank you for sharing what you’re doing in your studies. Visiting from Sunday Stillness. Hi Naomi. Yes, this idea of tabbing will work great even in a journaling notebook or prayer journal. It’s wonderful that you have come up with a creative way to remember where to find the stories you love and that are so valuable. Hope you have a wonderful day! Hi Heidi, I’m glad you enjoyed the idea. Have a great weekend! Thank you for sharing this. I, too, have struggled with where verses are and cannot find a word in the concordance. This is good…really good. I also tabbing up my notebook like Jennifer’s is good too. Then I can find these precious gems. Visiting from Sunday Stillness on Saturday night! Thanks for the visit Linda. I’m working it out in my mind how to tab my notebook as well. This is a wonderful idea. So many times I say, “somewhere in the NT#, lol. Thanks for the comment Sandy. Yes, that’s the exact reason I love this idea! I love this idea! Thanks for sharing. This is something on Pinterest that I could and would actually do! I know! Yes, something Pinteresty and for the average, or below average in my case, crafter! And time in God’s Word…ahhh. What a fun idea – and I LOVE your fancy tabs! Then again – maybe they would get a little in the way the more you add – but it looks so great! I am a journaler… new to art journaling – but I find when a Scripture stands out I ‘sketch’ it in my normal journal and doodle a bit around it… processing why it was highlighted to me! It’s one of my favorite things –going back through an old journal and finding surprise art amongst all the words! I think that may be one of the parts I’m most excited about–going back through and seeing the verses that stood out to me at a certain time and how I responded. I think this is a cute idea. I might try it on my verse journal. I keep my favorite verses written on a spiral notecard pad. That way I have them all handy and have to copy them down when I write them which helps with memorization. I have a hard time marking my Bible. I’m just such a perfectionist that once the pristine page is littered with a stray highlighter mark or a less than straight underline, something inside of me gets cranky. I have done it, but it isn’t my favorite way to do this. I totally get the perfectionist part. I’m working to get over it by using my journaling Bible this year. I consider it’s not what “it” looks like at the end of the year, it’s what I look like…hopefully more Christ like. What a great idea. I mean, sure you could have bought a practical paper punch, but I like the flare the fancy edges add. This was my first time using a pretty paper punch. I love Hobby Lobby’s 50% off sales!